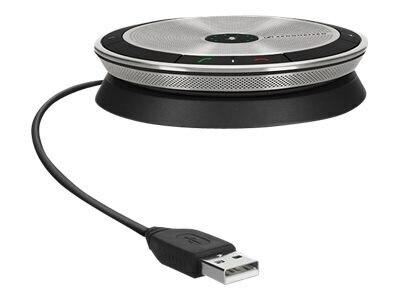 Sennheiser SP 10 ML is a premium portable speakerphone designed for Unified Communications business professionals to make both personal and small group conferences on PC/softphone. Sennheiser HD sound quality and voice clarity provide better user interaction. Lightweight, streamlined styling and superb finish give a high-quality appearance. Features include dual talk function, echo canceling, music setting and a protective carrying pouch.